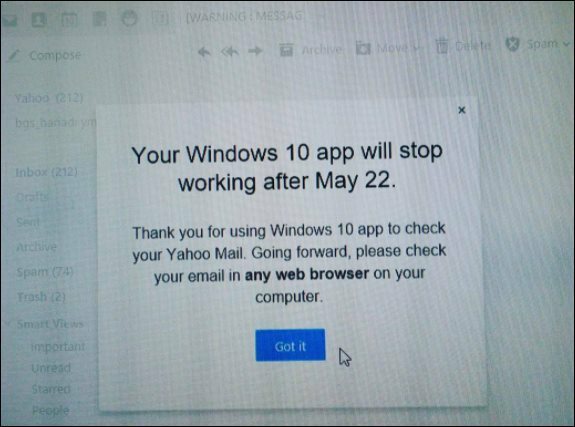 Yahoo is notifying users that its Mail app for Windows 10 will stop working next week after Monday, May 22nd and is no longer available from the Store. 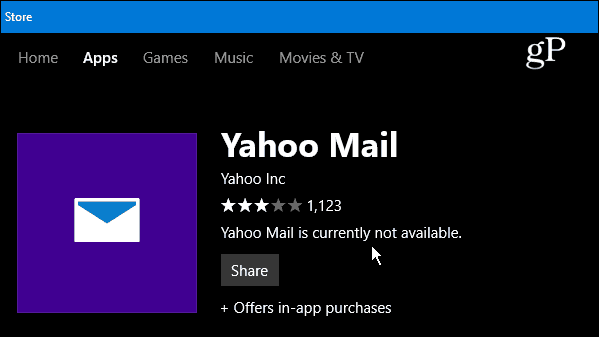 The Universal (UWP) Yahoo Mail app for Windows 10 is shutting down and will stop working next week. The company is already notifying users of the app that it will no longer function after Monday, May 22nd. Here is a look at the message users of the Yahoo Mail app for Windows 10 receive that one user posted on Instagram. At the time of this writing, the Yahoo Mail app is still listed in the Windows Store, but says “Yahoo Mail is currently not available.” Also, according to OnMSFT, “a large number of users have begun reporting on Twitter that the app has already stopped working for them” which suggests the company has already started the process of shutting it down. While the message from Yahoo points you to use the web version of Yahoo Mail you should also use another mail app like Outlook or the Windows 10 Mail app. For more on that read our article on how to add Gmail and other email accounts to the Windows 10 Mail app. Yahoo has had several security breaches to its user’s accounts dating back to 2012 and most recently last year when it confirmed 500 million accounts were breached. The app doesn’t seem as though it was too popular, here in the U.S. anyway. It’s not clear on why Yahoo is shutting it down, but one could surmise it has something to do with a lack of users and the company not wanting to waste resources on it. Are you using the Yahoo Mail app on Windows 10 or still have a Yahoo email address for that matter? Leave us a comment below and let us know if or how this app shutdown affects you. Although I am receiving e-mail, i can not send anything out. So I called to my provider (Rogers) and gone through the whole procedure with creating of new password and changing it in my account. What are the implications for Yahoogroups? This is the second time this year I have had to look for another email provider. I really prefer a desk top application to view my mail, rather than going to a web site…..I hate this…..now which one will I choose?? I am very disappointed! my yahoo e-mail address is the only one that I have ever used with every account that I have. it would be impossible to try and change it now. I have windows 10 and don’t know what to do. any help would be appreciated. Use any browser and go to mail.yahoo.com and then log in. Correct, just the App on Windows 10 is going bye bye, the Web Service from Yahoo! isn’t going anywhere. Ginny, Yahoo isn’t shutting down…just the Yahoo Mail app for Windows 10. Wow….do some people just not read the entire article??? Very helpful. I have Windows 10 on my laptop and from believe I’ll still be able to use the App on my iPhone and iPad. Please let me know if I my understanding is incorrect. I really enjoy your posts and have learned a lot since I’m not all that computer savvy. Thanks for sharing your knowledge with us. The main reason for quitting Yahoo Mail is simply that their UI is rubbish. I have only kept mine the past few years because Freegle is based on it, but even Freegle seem to finally be moving off the Yahoo platform so I can finally dump Yahoo now. I switched to my Gmail account and happy to do so. Apple Releases iOS 10.3.2 – What’s Included and Should you Upgrade?